90% of leaders say people and culture are the most important factors for driving innovation. On an initial glance that’s a great statistic… until you start to wonder what the other 10% believe! Are they putting technology or infrastructure or the general marketplace ahead of people? And if they are then do they really ‘get’ what a culture of innovation is all about? Or is it simply that 10% of leaders are still harking back to the days in which employees were simply a necessary expense? Admittedly there are a number of factors which will influence the success, or otherwise, of an innovation culture but the key to that success is the way in which leaders and employees step up to the challenge of working in a collaborative, agile and insightful environment. 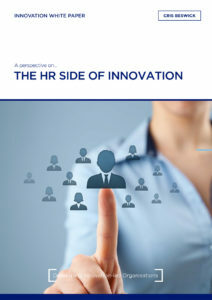 As a strategic advisor on innovation, I believe that in far too many cases, HR is sidelined in this process, being left to carry on with business as usual whilst the leadership team tries to impose seismic changes on working practices and attitudes. This white paper attempts to redress the balance by highlighting the importance of involving HR in the building and embedding of a sustainable culture of innovation.